When judged by their policies, Bernie Sanders and Donald Trump may be as different as any of the 2016 presidential candidates. But linguistically, they are surprisingly similar, united by their New York City accents. Nonetheless, our analyses of their speech patterns reveal some significant differences in how their NYC accents become stronger or weaker in different settings, namely interviews, speeches, and debates: Trump adapts his speech to certain factors, while Sanders does not. The NYC accent is famous among American English dialects. It is often portrayed in films and television series, and a number of notable celebrities are identifiable with the accent, such as Joan Rivers, Danny DeVito, Woody Allen, and Leah Remini. Thus, most English speakers in the United States can imitate a speaker from NYC, or at least how they perceive this speaker to sound. In fact, the prized aggressiveness that comes with Trump’s and Sanders’ NYC accents has been noted by researchers in linguistics. Speakers of this dialect are typically from northeastern New Jersey, western Long Island, the five NYC boroughs, and New York’s Hudson Valley. In addition, this dialect is simultaneously perceived as prestigious and stigmatized. Features of this dialect are often changing and a few classic NYC accent markers have ceased to exist, such as the pronunciation of thirty-third as “toity-toid”. 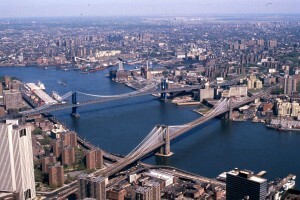 However, many features are still notable in NYC English. For example, dropping of the r-sound in words like park and war, as well as the distinctive pronunciation of the vowel in words like thought, caught, and daughter, are still alive in the NYC accent. These are two of the phonetic features that we use here for our comparison of Trump’s and Sanders’ NYC accents. In order to determine the amount of stylistic versatility that each candidate shows when faced with different speech contexts, we began by collecting video clips of interviews, debate content, and speeches. Additionally, we selected videos that reflect both New York audiences and audiences in other parts of America to test whether the candidates shift their accents to be more like that of the assumed accents of their audiences. 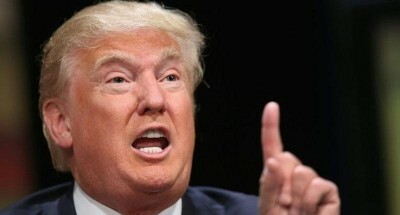 With the exception of the Trump gun-rights rally speech (April 2014), each clip was recorded during the 2016 presidential campaign between June 2015 and February 2016. All videos were found on YouTube and are linked in the table at the end of this post.The interviews show an unscripted back-and-forth between candidate and interviewer with high levels of interaction. By contrast, the speech and debate clips are scripted and delivered to large audiences, with little to no mutual interaction. Dropping the r’s – NYC English traditionally lacks an r at the end of syllables or after vowels. In NYC, words such as park and here are “r-less” (the technical term is non-rhotic) and are pronounced without the r: “pahk” and “heeuh”. THOUGHT vowel raising – For a few dialects of American English, words like cot and caught are not homophones, where cot sounds like “caht” and caught sounds like “cawht.” What we are specifically interested here is how speakers of NYC English produce a raised version of the vowel in words like caught, which we are calling the THOUGHT vowel. The raising of the THOUGHT vowel is, in part, what distinguishes NYC English from other accents that distinguish cot and caught. huge/yooge – For some speakers of NYC English, the y-sound, as in yes, cannot be preceded by the h-sound, as it is in words like huge, human, etc. This leads to words that are traditionally pronounced with an initial hy- having only the y-sound. Words such as human *(“hyooman”) and *huge (“hyooge”) will be pronounced as “yooman” and “yooge”. For Trump and Sanders, our data show how rhotic each candidate is in their speeches, interviews, and debates. Both Sanders and Trump are from NYC: Sanders is from Brooklyn and grew up in a working-class home, while Trump is from a much more privileged, upper-middle class family in Queens. They are from the same generation, as Sanders is only about five years older than Trump. While their social backgrounds are different, their patterns of r-pronouncing and r-dropping are similar — at first glance. Figure 1 shows that Trump and Sanders exhibit roughly the same degree of r-fullness when speaking to non-New York audiences. To be sure: this regular way of speaking is, for both candidates, quite notably New York — they drop between one third and one half of all r-sounds for which this is possible. 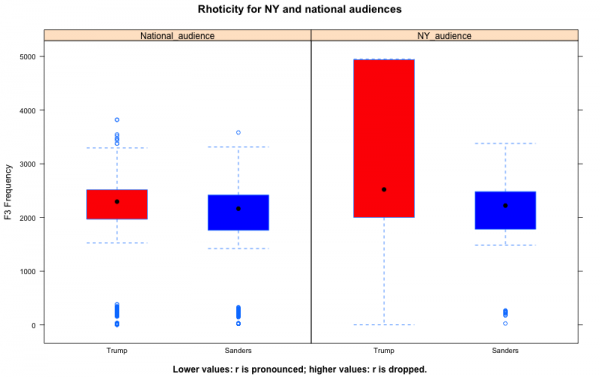 But in front of NYC audiences, it is Trump who becomes dramatically more r-less: his range of F3 values is much larger when he speaks in his hometown. Specifically, he reaches F3 values that are much higher than those of Sanders when in front of a NY audience. This shows that Trump is stylistically much more adaptive than Sanders — at least for this one accent feature. Sanders, meanwhile, shows practically the exact same use of r-sounds in New York and on the road. 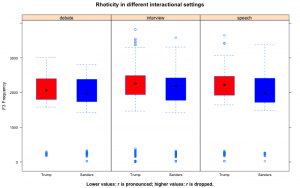 In Figure 2, we see that this Trump’s variability also holds when we look at speaking context: In his political speeches and interviews, Trump drops r-sounds more frequently than in debates. Sanders, meanwhile, is more steady in his use of this feature across all contexts, with a slight rise in r-dropping during his interviews. NYC English is, in part, defined by the distinction of the vowels in cot *and *caught. Trump and Sanders both maintain this vocalic distinction. For the majority of American English speakers, cot and caught are homophones, however speakers of NYC English can clearly distinguish two different vowels. Cot *is produced with the same vowel as in the word *father, while caught is produced with a raised version of what is known as the open-o. For this raised vowel, NYC English speakers may produce something like “caw-uht” for caught, *“law-uh” for *law, and “caw-uh-fee”* for *coffee. For an example of a NYC version of the THOUGHT vowel, listen to how the male speaker in this video pronounces the word coffee. The raising of what linguists call the THOUGHT vowel makes it almost a sequence of two vowels one after the other. As shown in Figure 3, Sanders sounds a fair bit more New-Yawkish than Trump in the aggregate picture (since lower values for the first formant, F1, indicate a more raised pronunciation). It would not be outlandish to explain this global difference in the two candidates’ pronunciations of the THOUGHT vowel by the difference in their upbringing: higher-class New Yorkers (such as Trump’s family) raise their THOUGHT vowels less than the working class folks from Brooklyn among whom Sanders grew up. In order to tease apart the treatment of this vowel by the two candidates, we used multivariate statistics. Results are shown in Figure 4. While this chart is somewhat more complicated than the preceding ones, it shows some crucial tendencies. Figure 4. Output of multivariate statistics model for THOUGHT by candidate, context, and audience. 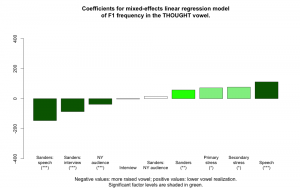 First, this chart shows that there is a small-ish, but highly significant tendency for both candidates to produce the THOUGHT vowel in a more raised way (i.e. with a lower F1 value) when they speak in front of New York audiences. This is unsurprising. However, our model also shows that Sanders has the opposite trend in his speech as compared to Trump. This means that the strategy of “pandering to the audience,” i.e. speaking more New-York-like when in New York, is represented mostly by Trump, not by Sanders. Again, Sanders appears more solid in his usage across contexts. 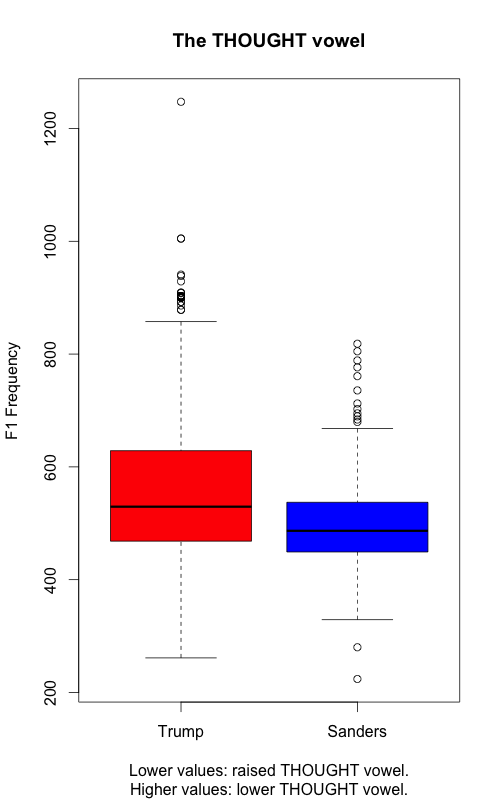 Next, we see that the two most extreme terms in the model are “Sanders : speech” (far left) and “Speech” (far right). What this shows is the trend that overall in the data, the candidates seem to turn on the New York accent the most when they give political speeches, in comparison to interviews and debates. But again, Trump does so significantly more strongly than Sanders. Outside of speeches, Trump sounds much more mainstream American, while Sanders still sounds like the same strongly-accented New Yorker. We ran an analysis to see how Sanders and Trump differ in terms of their dropping or retention of the h-sound in these speech contexts. From our data, it seems that Sanders is a much more frequent user of words that can drop the initial h-sound: we counted five words for Trump and ten for Sanders which started with a possible “yoo” or “hyoo” sound. Trump drops the h-sound in all five instances (e.g. “yoomane”* for *humane). Meanwhile, Sanders’s reduction of the h-sound is almost as categorical as Trump’s. Of his ten instances words that are relevant for this feature, he maintained one h-sound (namely, in the word human). Overall, we find that the huge/yooge feature is a point of linguistic commonality between the two candidates. Both Donald Trump and Bernie Sanders are easily categorizable and recognizable as speakers of NYC English, showing high usage levels for all of the features we studied. Trump is a pliable adapter and linguistic performer who alters his speech depending on whom he speaks to and in what contexts. He shows the highest usage levels for New York accent features when giving political speeches and when addressing audiences in New York. The same factors have only the slightest effect on Sanders’ speech, if any at all. 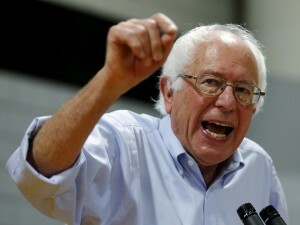 Sanders frequently drops his r’s and raises his THOUGHT vowels, consistently across contexts. He does not change his speech to accommodate the rest of the world. The tendency of style-shifting, which Trump shows much more strongly than Sanders, is common in the speech of politicians. What is remarkable is the fact that we do not see it in Sanders. Although Sanders has spent many years in Vermont, outside of the cultural space of NYC, he remains a completely steady, unperturbed, almost textbook speaker of NYC accent of English.